Having had a charity tennis tournament rained out this afternoon, I’m back home and watching the rain continue to dump on us, so it seems apt to talk about a water sport instead. Many years ago, I rowed in eights and fours in England (on the River Thames), even once taking part in the Head of the River race (which looked a little like this recent example); latterly, I’ve been more into enjoying ‘easy’ kayaking with Steve (we brought a couple of ocean kayaks with us to the island), so I was keen to give the traditional Hawaiian outriggers a go. 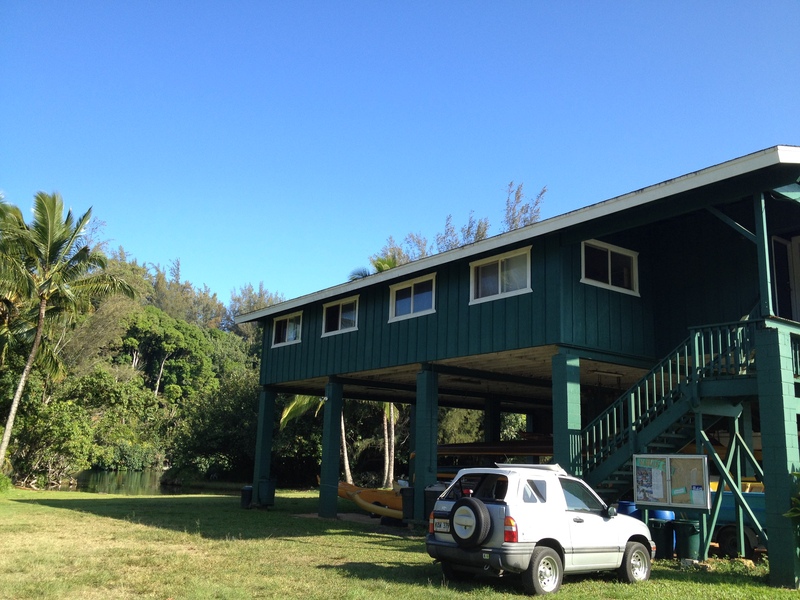 Luckily, I joined Hanalei Canoe Club (HCC) during the off-season, so I had a few months of recreational-level paddling with a small (i.e. ‘quality not quantity’) group who regularly go out on Monday and Friday mornings. Since the paddling stroke is very different from rowing, this gave me a chance to learn the ropes and start to ‘educate’ the required muscles before the serious training began, which it did in February. Training sessions are now Monday and Wednesday evenings, and also Saturday mornings if there isn’t a race. 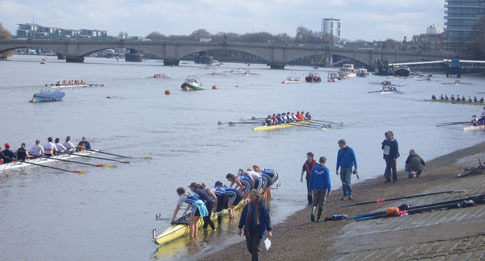 As the season goes on, there will be a race or regatta on most Saturdays. 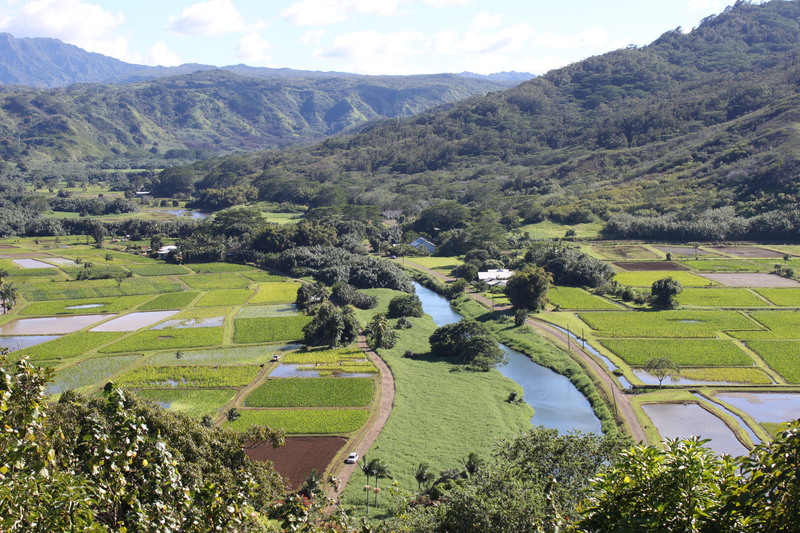 Hanalei River passes through the Hanalei Wildlife Refuge and taro fields. During winter months, we train up and down Hanalei River, but when the ocean calms down in the summer we’ll get out into Hanalei Bay. We paddle in most weather conditions, wet or dry, so training is rarely canceled (unlike tennis)! It’s harder work on windy days and when the river is flowing fast, but on a good day (and there are plenty of those), the views are spectacular. Either way, it’s exhilarating and a great work-out. It’s also a very sociable activity, and it beats going to a gym. I’m thoroughly enjoying my new sport, not just for the activity itself, but also for the friends I’ve made, and for all I’m learning about the tradition of the sport and Hawaiian culture. The club members are an enthusiastic and close-knit group. 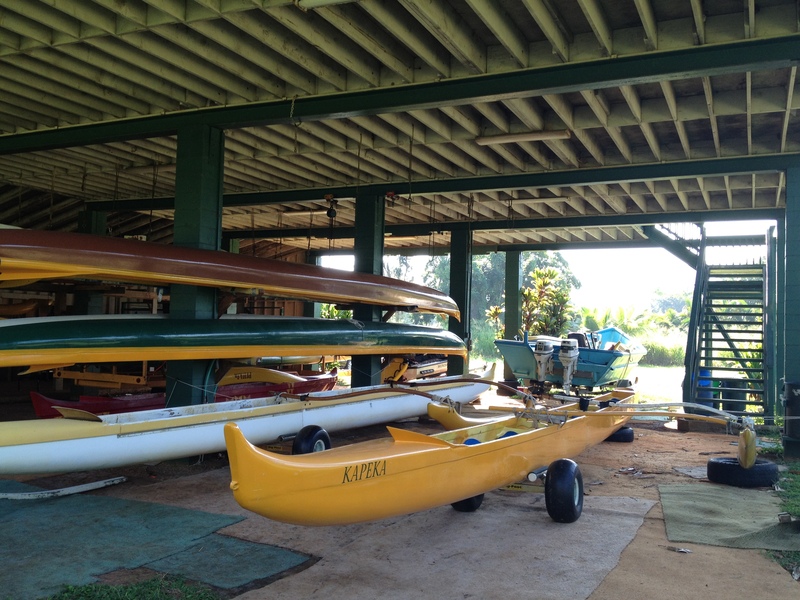 Everyone helps to lug all the canoes in and out of the water, and no one leaves until all the canoes are rinsed and stowed away under the building. Every training session ends with us all (30-35 paddlers on most days) gathering in a circle for announcements and the closing HCC Hawaiian chant. Below is a brief gob-smacking look at the 2012 Na Wahine O Ka Kai event – a long distance women’s race from Molokai to O’ahu. The 2012 event was <um> pretty brutal! This clip shows the teams struggling to get out from the shore to the start line!